The content of this article provides interesting history, facts and information about the Emperor Gordian III and the all-powerful Caesars who ruled the empire of Ancient Rome. "Grandson Of Gordian I and Nephew Of Gordian II"
Short Biography profile and facts about one of the most famous Romans of all, in the life of Gordian III, Emperor of Rome and provinces of the Roman Empire. Obtain a fast overview of the times of the Roman Emperor Gordian III from the following facts and information about his life. Why was Gordian II famous? Accomplishments, achievements and important events. The grandfather and uncle of Gordian III were the emperors Gordian I and Gordian II. These Gordians had reigned only thirty-six days during the Year of the Six Emperors. The Senate immediately elected Pupienus and Balbinus co-emperors, to whom, in order to gratify the people, they joined the younger Gordian who was then only twelve years old. He reigned 22 April – 29 July 238 as Caesar to Pupienus and Balbinus and then as sole emperor until his death in 244. The Goths on the Danube and the Persians in the East now assailed the Roman empire, and at the same time the Praetorian Guards murdered Pupienus and Balbinus, leaving Gordian III as sole emperor of Rome. Gordian III was married to the daughter of Misitheus, Prefect of the Praetorians, an excellent minister and commander. Together they marched to the East, and defeated the Persians under their king Sapor, in various engagements. Misitheus died, and Gordian III appointed the Arab Philip as his prime minister. 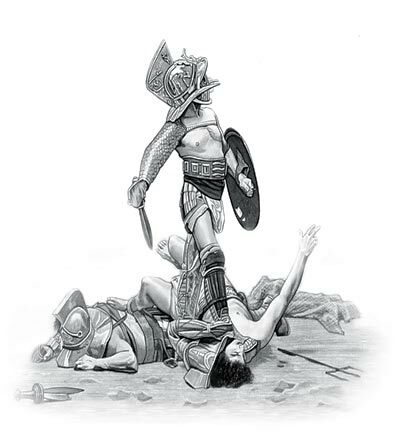 King Sapor was again defeated. The treacherous Philip the Arab then conspired against his benefactor and Gordian III was assassinated on 11 February 244 in Zaitha, Mesopotamia. Gordian III was just aged 19 years of age when he was lynched by his own soldiers. The Crisis of the Third Century was the period in Roman history following the death of Alexander Severus when Rome entered into the era of Military Anarchy commonly known as the Crisis of the Third Century. During the Crisis of the Third Century, lasting over 50 years, not one single Emperor died of natural causes. Revolts sprung up in virtually all of the provinces and ambitious men struggled for power. During the crisis there were civil wars, street fights between the citizens of Rome and soldiers of the imperial guard, fierce foreign enemies, plagues, famines, fire and earthquakes. The Year of the Six Emperors (238) and the start of the Barracks Emperors. There were six emperors in 238 AD and each of them were officially recognized by the Roman Senate. Their names were Maximinus Thrax, Gordian I, Gordian II, Balbinus, Pupienus and Gordian III. By the end of the Year of the Six Emperors five had died a violent and bloody death leaving the 13 year old Gordian III as the sole Roman Emperor. The content of this Gordian III category in the Emperors of Ancient Rome provides free educational details, facts and information for reference and research for schools, colleges and homework. Refer to the Colosseum Sitemap for a comprehensive search on interesting different categories containing the history, facts and information about the lives and people of Ancient Rome.